Organized in November, 1861, under Colonel Samuel Steedman, it moved from camp February 7, 1862. The Regiment arrived at Fort Donelson on the 14th and took part in the battle at that place. In March it moved to Pittsburg Landing and guarded supply trains during the battle. It took active part in the siege of Corinth, and after the evacuation moved to Bolivar, Tenn. The Regiment participated in the battles of Iuka and Matamora, and joined Grant's Mississippi campaign. In the spring of 1863 it operated with Grant about Vicksburg, and members of the Regiment passed the batteries at Vicksburg on transports. In May it marched to the rear of Vicksburg, and was engaged at Raymond, Champion Hills, and during the siege. It moved upon Jackson and returned again to Vicksburg, with many prisoners. In February, 1864, it joined the Meridian raid and on its return went to Ohio on veteran furlough. It joined Sherman's Atlanta campaign in June and participated in the battles about Atlanta until the close. It followed Hood north and again turned southward and marched to Savannah, then followed Sherman through the Carolinas and onward to Richmond and Washington. It was mustered out at Louisville July 10, 1865. 68th Regiment Infantry. Organized at Camp Latta, Napoleon, October to December, 1861. Moved to Camp Chase, Ohio, January 21, 1862, thence ordered to Fort Donelson, Tenn., February 7, Attached to 3rd Brigade, 3rd Division, Military District of Cairo, February, 1862. 2nd Brigade, 3rd Division, Army of the Tennessee, to May, 1862. 3rd Brigade, 3rd Division, Army of the Tennessee, to July, 1863. Unattached, District of Jackson, Tenn., to November, 1862. 2nd Brigade, 3rd Division, Right Wing 13th Army Corps, Dept. of the Tennessee, to December, 1862. 2nd Brigade, 3rd Division, 17th Army Corps, Army of the Tennessee, to July, 1865. SERVICE.--Investment and capture of Fort Donelson, Tenn., February 12-16, 1862. Expedition toward Purdy and operations about Crump's Landing March 9-14. Battle of Shiloh April 6-7. Advance on and siege of Corinth, Miss., April 29-May 30. March to Purdy, thence to Bolivar, and duty there till September. March to Iuka, Miss., September 1-19. Battle of the Hatchie or Metamora October 5. Grant's Central Mississippi Campaign, operations on the Mississippi Central Railroad, November 2, 1862, to January 10, 1863. Reconnoissance from LaGrange November 8-9, 1862. Moved to Memphis, Tenn., January 20, 1863, thence to Lake Providence, La., February 22. Moved to Milliken's Bend April 10. Movement on Bruinsburg and turning Grand Gulf April 25-30. Battle of Port Gibson May 1. Forty Hills and Hankinson's Ferry May 3-4. Battle of Raymond May 12. Jackson May 14. Battle of Champion's Hill May 16. Siege of Vicksburg May 18-July 4. Surrender of Vicksburg July 4, and duty there till February, 1864. Expedition to Monroe, La., August 20-September 2, 1863. Expedition to Canton October 14-20. Bogue Chitto Creek October 17. Meridian Campaign February 3-March 2, 1864. Morton February 10. Veterans absent on furlough February 20-May 8. Moved to Cairo, Ill., May 7-8, thence to Clifton, Tenn., and march via Pulaski, Huntsville and Decatur, Ala., to Rome and Ackworth, Ga., May 12-June 9. Atlanta (Ga.) Campaign June-9-September 8. Operations about Marietta and against Kenesaw Mountain June 10-July 2. Assault on Kenesaw June 27. Nickajack Creak July 2-5. Chattahoochie River July 5-17. Howell's Ferry July 5. Leggett's or Bald Hill July 20-21. Battle of Atlanta July 22. Siege of Atlanta July 22-August 25. Flank movement on Jonesboro August 25-30. Battle of Jonesboro August 31-September 1. Lovejoy Station September 2-6. Jonesboro September 5. Operations in North Georgia and North Alabama against Hood September 29-November 3. March to the sea November 15-December 10. Siege of Savannah December 10-21. Campaign of the Carolinas January to April, 1865. Pocotaligo, S.C., January 14. Salkehatchie Swamps February 2-5. Barker's Mills, Whippy Swamp, February 2. Binnaker's Bridge, South Edisto River, February 9. Orangeburg, North Edisto River, February 12-13. Columbia February 16-17. Battle of Bentonville, N. C., March 20-21. Occupation of Goldsboro March 24. Advance on Raleigh April 10-14. Occupation of Raleigh April 14. Bennett's House April 26. Surrender of Johnston and his army. March to Washington, D.C., via Richmond, Va., April 29-May 20. Grand Review May 24. Moved to Louisville, Ky., June 1, and duty there till July. Mustered out July 10, 1865. Regiment lost during service 2 Officers and 48 Enlisted men killed and mortally wounded and 1 Officer and 249 Enlisted men by disease. Total 300. Gold miner, doctor, real estate speculator. 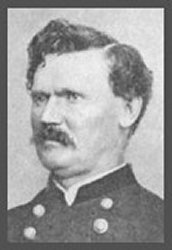 1861 Maj. in 68th Ohio, Lt. Col., Col., Vicksburg campaign, Atlanta campaign, Carolinas campaign, January 1865 appointed Brig. Gen. of Volunteers. Served in Freedmen's Bureau, governor of South Carolina. He participated freely in a very corrupt administration in South Carolina. At many events there are not enough Union reenactors so many units agree to galvanize or change sides to make the event more realistic. We portray the 68th Ohio Inf because they are a unit that came to Savannah with General Sherman on his march to the sea.